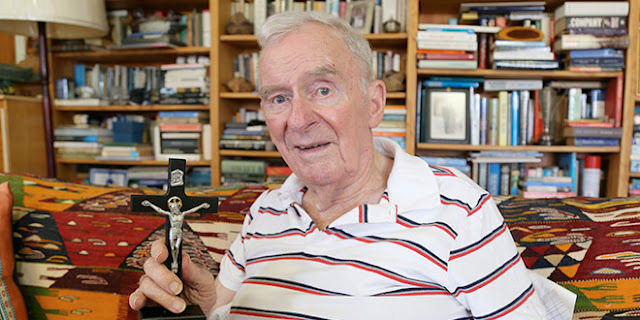 Former governor-general and declared atheist Bill Hayden is eagerly anticipating the joy of his First Holy Communion. “It will be exciting because I have never done it before in my life,” the 85-year-old said. He lives outside Ipswich, Queensland. “There was an emptiness here that’s filled up now,” he said. “… I’m part of the Church, and I feel better for acknowledging I am part of it.” Ipswich parish priest Franciscan Father Stephen Bliss said he would “sit down and talk” to Mr Hayden about Church teachings and prayer, and his passage to receiving his First Communion during Advent. .
Mr Hayden has received a flood of congratulatory letters and emails – including one from former prime minister Kevin Rudd – and other gifts including packets of Rosary beads and a large-print Bible with the name Bill Hayden embossed in gold on the leather-bound jacket. Mr Hayden explained his lifelong distrust of religion, was shaped during a violent and unhappy childhood. It was a recent hospital visit to see an old friend, 93-year-old Sr Doyle, that proved the pivotal moment in Mr Hayden’s faith journey. “My chest felt happily congested with the feeling … she had a profound influence on me … she’s probably the influence that caused me to become a Catholic. “One Sunday I went to Mass, would you believe it, I was still an atheist … and I walked into the (St Mary’s) church and as I walked through the door I could feel a strange coolness and a reverential feeling – I felt secure. Mr Hayden said he was looking forward to Christmas, his first as a Catholic. “I might make midnight Mass at St Mary’s. It’s going to be more meaningful, now I’m one of the faithful,” he said. Share this Amazing True Story to Inspire Others to Embrace the Faith!